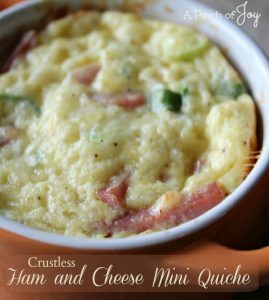 This crustless Ham and Cheese Mini Quiche is low on the carb scale – like 3 grams of carbs with 12 grams of protein. Healthy enough for every day and deliciously handsome and tasty enough for company! Ham and Cheese Mini Quiches work very well as a make ahead and freeze till needed dish. Great for overnight guests! Breakfast fit for royalty in a flash and no fuss. Or thaw one or two overnight and warm in the microwave for a quick breakfast before work or heading off to school. These cozy little quiches also make a nice dinner with a crisp salad on the side. Nutmeg is frequently used in Swedish cooking particularly. And often for custard type dishes in other cuisines. I’m always a little startled when I see it in a savory dish since I associate it with sweet desserts. And my family is always startled by the taste. It dominates the savory for us so I tend to leave it out. (And Wheels has some Swedish ancestry!) Try it– you may like it. The Swiss cheese has a good, somewhat tangy, flavor, but if available try substituting Guyere or even Havarti. We love the taste of this. I even like it cold the next day! Or better, with the refrigerator chill knocked off by 15 seconds in the microwave. Prep time is relatively quick. Unless you run out to the garden to get a couple of green onions and get sidetracked – ahem. I use prediced ham which saves time. Either buy the package of diced ham or make your own purchased on after holiday sale and diced, then frozen in 1 cup packages. Baking time really does depend on the size of the quiche. The mixture gives a clear reading with the knife inserted in the middle. When it is done, the knife comes out clean and won’t leave you guessing. This time I used ramekins that held just over 2/3 cup of mixture ready for baking and had five quiches. (Note: this will double the number of carbs and amount of protein in each serving.) They took 18 minutes in my oven. Standard muffin tins hold ½ cup in each opening, but since we are allowing for rise of the mixture they are only filled about 2/3 full. That’s between ¼ and 1/3 of a cup of quiche mixture. Baking in a muffin tin will produce between 10 -12 quiches. That’s eyeballing and not measuring what goes in each muffin cup – ‘cause who has time for that! Sometimes my eyeball is working and everything evens out at 12 – other times it’s 11. Healthy enough for every day (low carb) and deliciously handsome and tasty enough for company (make ahead and freeze till needed)! In large bowl combine the first seven ingredients, the fold in cheese,ham, and onion. Grease muffin pan OR spray with cooking spray. Fill each cup about ⅔ full of quiche mixture. Cool 5 minutes before removing for removing from pan.